On site at 51 Bay View Road, choose from waterfront studios, modern 2 bedroom "Ocean View" cottages or the indulgence of the "Beach House" with wood fire and jacuzzi. Driftwood is now proud to be associated with the new "Essentially Tas" brand, featuring a unique collection of accommodation throughout the Huon Valley and Far South, as well as options in Hobart and surrounds. 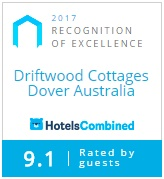 Whether you are seeking a budget stay with homely touches...a truly luxurious Tasmanian accommodation experience...or the ultimate exclusive getaway...Driftwood has a range to suit every need. Driftwood Cottages accommodation is all fully self-contained. Every unit features a private bathroom, full kitchen facilities and private balcony- all with spectacular views over Port Esperance Bay.